The battle for European football glory is reaching its decisive stages and the draws of the UEFA Champions League and Europa League quarter finals have set some exciting matches. The battle is not only on the pitch as kit suppliers wish to see their teams do well and hoping for a single supplier final. 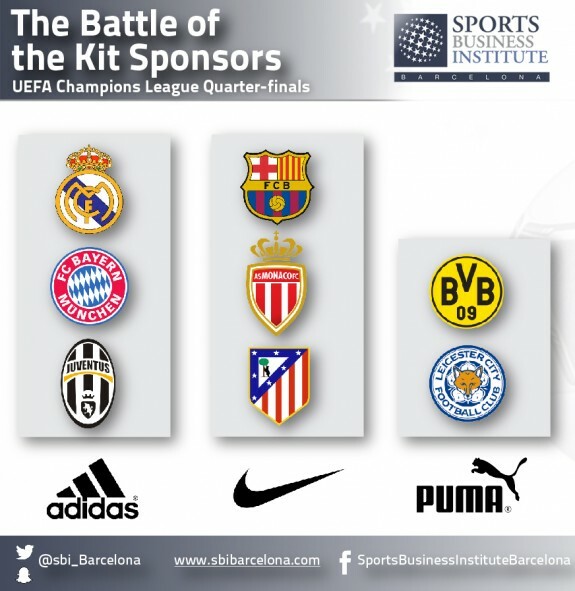 Below we will analyze the eight remaining clubs of the Champions League and their respective kit sponsors. At present, Adidas and Nike provide kits to three clubs while Puma provides to the remaining two. An all Adidas clash. At Bayern, Adidas is shareholder with 8.33% of the club’s shares. In 2011 Adidas and Bayern celebrated 50 years together by extending the partnership until 2020. In 2015, the two decided to extend the partnership even further until 2030 in what is estimated to be €900M deal. As for the relationship with Real Madrid, the partnership began in 1998 and is expected to run until 2020. It is reported that the current deal is valued at $34M and recently rumors have surfaced the club is considering an offer of $158M per year from Under Armour. Under Armour’s involvement so far in football includes Tottenham Hotspur and Southampton. Barcelona’s deal with Nike dates back to 1998. In 2016 and extension was agreed making the deal the most valuable in football by surpassing Manchester United’s deal with Adidas. The value of the deal is estimated at €155M per year and will be official from the beginning of the 2018-19 season. Juventus, on the other hand, switched to Adidas in 2015 in a deal worth €139.5M for six years. In 2011 Borussia Dortmund and Puma announced a long-term partnership in a deal expected to run until 2020. In 2014, Dortmund announced on capital increase involving a sale of shares to its three main partners, Puma , Evonik, and Signal Iduna. Puma currently owns 5% of the club. Monaco switched from Italian manufacturer Macron to Nike for the 2014/15 season in a deal that is expected to run until 2019. Atletico Madrid vs Leicester City Atletico’s partnership with Nike began back in 2001. In the summer of 2014 the two parties extended the agreement until 2026 which will see them celebrate 25 years together if the deal will run through to its expected deadline. The value is not disclosed but following Atleti’s success and growth in reputation we might see the deal renegotiated. Leicester City’s success last season saw them run out of official kit stock supplied by Puma. Leicester and Puma have been together since 2012 and in the Summer of 2015 the deal was extended for an undisclosed term. Leicester title-winning season sent the fans to flock the official store prior to the final game of the 2015/16 campaign when the 2016/17 kit was revealed. The club sold the new kit in 10 times more than on the first month of the season. Leicester took the partnership with Puma even further when the club announced that the club’s mascot, Filbert Fox, has signed a boot deal with Puma. It is evident that Adidas is the dominant force in this year’s Champions League besides being the official sponsor of the competition. It will be interesting to see how the landscape of kit suppliers will change in the future as it seems impossible to destabilise Adidas’s and Nike’s control. If Real Madrid’s rumoured potential deal with Under Armour will go through we may see the American brand getting more involved in European football and trying to secure more top clubs. New Balance has made great progress in recent years securing some notable teams along with recognisable brand ambassadors such as Aaron Ramsey and Kasper Schmeichel. However, NB admitted that they don’t seek competition with Adidas or Nike as they’re too powerful and set a more realistic target to overtake Puma as the third manufacturer in football. This article was written by David Haimovich, Marketing Assistant at the Sports Business Institute Barcelona. If you have any comments or questions about this post feel free to contact him at david.haimovich@sbibarcelona.com. You can also follow him on Twitter at: @HaimovichDavid.